Sea level is rising at present and this rise provides some important insight into recent climate change — a warmer planet means the transfer of glacial ice to the oceans, and warming of the oceans causes an expansion of seawater. There are two main ways to directly measure recent changes in sea level — tide gauges and satellites. Tide gauges are fairly simple devices that record the height of sea level at a particular spot; the records are dominated by the daily tides (see photo below), but the data can be used to estimate the average sea level height each year. Example of a tide gauging station from Anchorage, which has a huge tidal range. Tide gauges measure the height of sea level relative to the ground, and if the ground is stable, then they may be recording a global sea level change; if the ground is unstable, then the tide gauge record is difficult to interpret. Sites that are near the boundaries of tectonic plates are geologically unstable, so their tide gauge records are not reliable. Other sites located near the locations of formerly large ice sheets are also unstable in the sense that the land there is rising due to the removal of the ice from the last glacial age. This ice weighed a great deal (it was around 5 km thick) and its removal has triggered a very slow, steady rise of the crust — it’s like pushing down on a block of wood floating in the water and then removing your hand — the block rises up. Extending this analogy to the Earth, the block of wood is the crust and the water is the mantle, which is a very, very sluggish fluid, thus the crust does not spring up quickly, but takes several tens of thousands of years. If the land is rising up, then it would appear that sea level is falling, and indeed, this is seen in many tide gauge records from polar regions. Tide gauge record from Churchill, Ontario (Canada), on the edge of Hudson’s Bay showing falling sea level. This tide gauge record comes from Churchill, Ontario (Canada), on the edge of Hudson’s Bay; here, you can easily see the downward trend, meaning that sea level appears to be falling, but this is just in a relative sense. The story here is that the crust is rising, so sea level appears to be falling. The crust is rising in response to the melting of an ice sheet about 5 km thick that was present during the last ice age. Because of the problem of crustal stability, tide gauge records have to be selected very carefully if we want to learn something about how global sea level is changing. Not surprisingly, this work has been done (Douglas, 1997), and a set of 23 tide gauge records have been selected, shown in the figure below. This figure shows the change in annually averaged sea level from 23 tide gauges with long-term records (Douglas, 1997). The thick dark line is a three-year moving average of the tide gauges. The rise of sea level is not constant or simple, but the overall trend is fairly easy to see, indicating a rise of about 20 cm during this time period, at a rate that is about 2 mm/yr over the last 100 years. The red line shows changes in global sea level as measured by satellites, and you can see that there is very good agreement. The satellite data are interesting to consider — how can a satellite measure sea level changes? The answer is surprisingly simple at one level — it just measures the distance from the satellite to the sea level surface. The figure below shows how the system works, using a radar beam that bounces off the water surface and returns to the satellite. The height of sea level is actually the difference between the distance between the satellite and the sea surface and something called the reference ellipsoid, which is a kind of smoothed approximation of the Earth’s shape. 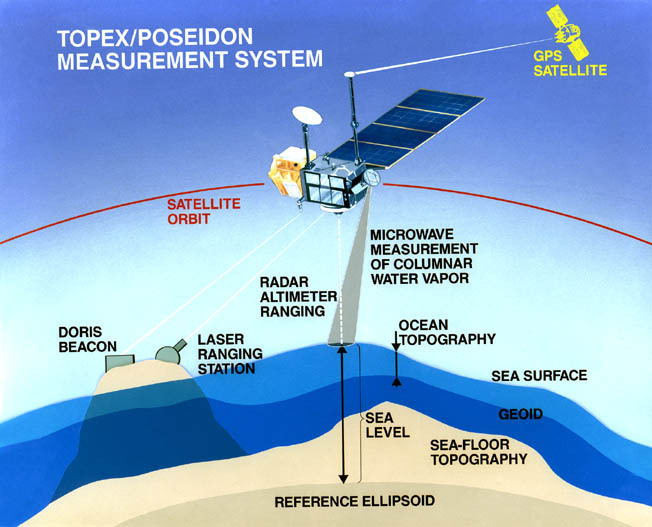 Schematic diagram showing how the TOPEX/POSEIDON satellite system monitors sea level height relative to the reference ellipsoid. The satellite is orbiting the Earth at a height of around 1300 km and can cover the surface of the oceans in 10 days, making several hundreds of thousands of measurements during that time, and keeping very close track of where it is located relative to some control points on the Earth. As a result, this system can measure the mean sea level to within a few millimeters — quite a remarkable achievement. The figure above show the details of the satellite-based measure of sea level change, spanning just 18 years. There is a very regular annual variation of about 15 mm and then a more steady rise of about 50 mm over this 18 year period, giving us a rate of rise of about 2.8 mm/yr, which is somewhat higher than observed from the tide gauge data over the last 100 years. These observations show that sea level is undoubtedly rising, but in a somewhat irregular pattern, and lead us to ask why. What is causing this rise in sea level? There are two main explanations for this rise. One is a simple expansion of seawater as it warms and becomes less salty — this is known as the steric effect. As seawater expands, it takes up a greater volume, and so the sea surface elevations rises. If the sea water warms by 1 °C, the steric sea level rise would be about 7 cm. An additional small increase comes from a slight freshening of the oceans — salty water is denser than fresh water. This steric effect is believed to account for the majority of the observed sea level rise. The other main reason for sea level rise is from the melting of glaciers, which transfers water previously stored above sea level back to the oceans. As we have seen, mountain glaciers around the globe are melting and so are the big ice sheets of Greenland and Antarctica. The effect of warming and freshening of the oceans is believed to be behind the annual cycle seen in the above satellite data. As you might expect, the warming and freshening do not occur uniformly across the globe, so the global pattern of sea level rise and fall is somewhat complicated, and this goes a long way toward helping us understand why the tide gauge records (from the “stable” sites) show considerable variations. Looking further back, we must rely on the geologic record. Benthic foraminiferal species that live in marshes have narrow depth ranges. Foraminifera found in cores of tidal marsh sediments can yield the depth at which they live and dated to provide an age. In this way, geologists have determined changes in sea level of the North Carolina coastal zone back to 0 AD, before tidal gauges were employed. The curve shows a sharp increase in the rate of sea level rise in the middle of the 19th century, coincident with the Industrial Revolution. Sea level change in North Carolina back to 0 AD obtained from benthic foraminifera in peat sediments. Credit: Figure from Kemp et al., Geology, v. 37, p 1035-8. Credit A. Kemp. Corals provide a reliable way to determine sea level in the past since they grow within about 5 meters of the sea surface (see Module 7). If we find a coral submerged at 200 meters (see below), then sea level must have been 195-205 meters below current levels. In this way, sea level for the last 22 thousand years has been developed using the depths of corals, dated using carbon-14 or uranium isotopes, below current sea level. This figure shows sea level rise since the end of the last glacial episode based on data from Fleming et al. 1998, Fleming 2000, & Milne et al. 2005, who collected data from various reports and adjusted them for subsequent vertical motions related to post-glacial rebound. Most of the data here come from radiocarbon dating of corals that are found below modern sea level — these particular corals are known to grow in water depths of just a few meters, so for them to be found at such depths below modern sea level requires that the ancient sea level was much lower. Drowned coral reef from150 m water depth off Hawaii. Besides coral, there are other indications of sea level rise. Fjords are drowned glacial valleys, and estuaries such as the Chesapeake Bay, are drowned river valleys. Both of these morphological features indicate that sea level has risen recently. We can see that sea level changes much more dramatically on the timescale of the ice ages. The last ice age peaked around 20,000 years (20 kyr) ago, and at that time, a great deal of water from the oceans was locked away in large ice sheets, so sea level was about 120 m lower than it is today! This is a colossal change and it would have dramatically changed the coastlines of the world. It is interesting to consider the rate of sea level change associated with this transition out of the last ice age. Sea level rose by about 120 meters in about 10 kyr, giving us a rate of 12 mm/yr, which is about four times faster than the average rate of sea level rise today. Imagine what the world looked like 20,000 years ago when sea level was so much lower. To help, look at the figure below, which shows the elevation both above and below current sea level. The modern shoreline is easy to see — it is where the green colors begin. The black line offshore shows about where the shoreline was when sea level was 120 meters lower than today. Elevation map of part of North America showing the approximate position of the shoreline during the last glacial maximum when sea level was about 120 meters lower than today due to the formation of large ice sheets. Now, more realistically, let's imagine what will happen to the coastal zone in coming centuries if sea level rise accelerates. We will observe flood maps in the following lab.